While oil-related stocks have corrected nearly 10% in recent weeks, the sell-off in the commodity has been almost non-existent. The chart in the lower right plots the ratio between the price of the S&P 500 oil and gas group vs. the price of the commodity. 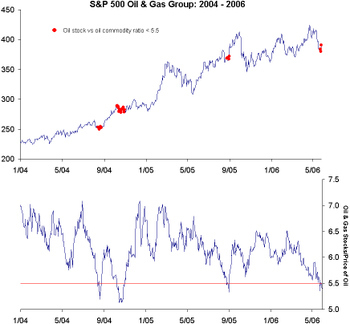 Low readings indicate that the price of oil stocks are cheap relative to the price of the commodity while high readings imply that oil stocks are expensive relative to the price of the commodity. As the chart details, over the last two and a half years, there have only been three other periods where the ratio was lower. What a gorgeous day it is here in the Northeast on this Memorial Day as we honor and remember those Americans who have fallen in war. The posts may be a little thin over the next couple of days as we finish up the monthly Birinyi Reminiscences Newsletter that goes out on Wednesday evening. This month we are adding a new two-page feature that grades the 30 major industry groups in the US based on multiple factors to find the ones that currently look the most and least attractive in today's market environment. It is sure to not disappoint. Remember you can sign up easily at the left of this page for the Newsletter service in which you'll receive the monthly Reminiscences and the weekly Birinyi Stock Ratings. In the meantime, if you haven't yet clicked on the "About Ticker Sense" button at right, be sure to check it out to learn more about who we are and what we do. You can also browse through the categories and archives sections to see all of the stuff that is no longer on the main page here. As we're sure you've heard tons of times before, it is always wise to review prior work to see which analysis has been dead on or which analysis was completely wrong. There are plently of great reads out there on the Web today but we'll leave that to these two links posts over at The Kirk Report and The Big Picture. They always do a great job of filtering through and finding the most interesting and important articles out there. 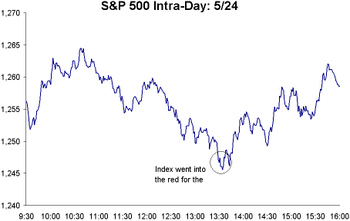 Going back to 1960, the Tuesday following Memorial Day has been an up day for the S&P 500 only 41% of the time. The markets tend to recover for the full week however, averaging a 60 basis point gain and going up 59% of the time. If we aren't back again by the end of the day, have a great three-day weekend! 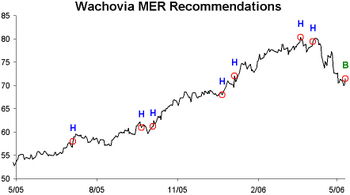 After numerous upgrades in the brokerage stocks this morning, it looks like some analysts are using the recent weakness in the group to finally get out of their long-standing hold ratings. How Concerned Should We Be With Emerging Markets? Earlier this week we commented that the current decline is most likely not a repeat of the experience of 1987. Since then we have received many comments suggesting that instead of focusing on the US, we should be focusing on what's going on in emerging markets as those markets appeared to be in the early stages of crashing, (India and Russia were cited as two examples) setting up the stage for a contagion to our markets similar to 1998. Here again, we would like to highlight one major difference. 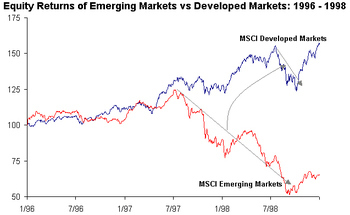 In 1998, emerging market stock markets were already in steady downtrends dating back to July 1997. So it took over a year of poor returns for the bear market in those regions to dramatically impact the US market (The US markets did have a hiccup in 1997 too but even in that case it took three months of economic chaos as opposed to the current two-week selloff to have any impact here). 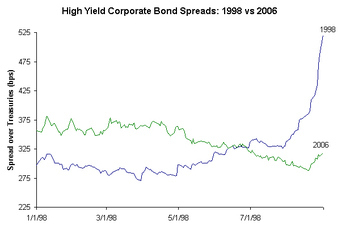 Another difference between now and 1998 is that credit risk skyrocketed in 1998. As shown in the chart below, interest rate spreads between junk bonds and treasuries hit extreme highs meaning that liquidity in the markets dried up. Today, even after the declines we've seen in the most recent correction, credit spreads remain near 52-week lows. So while it is always important to monitor events around the world for their potential impact on our markets, we would caution against extrapolating a correction in emerging markets to an imminent market crash. With gas prices over $3 a gallon and those pesky health care costs, GM has to be one of the weaker performing DJIA members this year, right? Nope - the stock is currently up 45% this year and by far the best performing stock in the Dow 30. 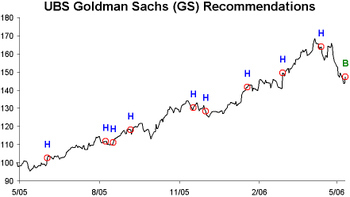 Looking back to the start of '06, GM had the weakest ratings by equity analysts of any stock in the Index and still does - there are currently 4 buy ratings on the stock, 8 holds, and 7 sells. 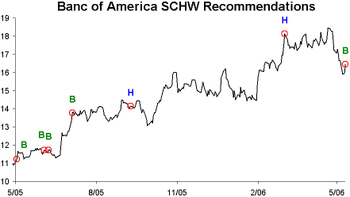 And we all know how hard it is for an analyst to give one of those sell ratings. Is That a Late Day Up Trend? 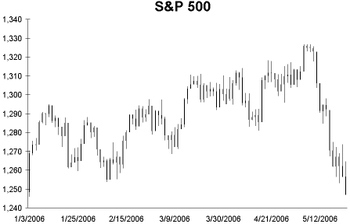 For those interested, the S&P 500 has just moved into negative territory for the year. Maybe this will act as some sort of psychological support. Yesterday we highlighted that One Major Difference between the Crash of '87 and the current market environment is that the S&P 500 had rallied much more heading into that crash than it has recently. "The dollar is falling, but not nearly as sharply as it was in 1987. Compared with a year ago, it is nearly unchanged against the euro and stronger against the yen. 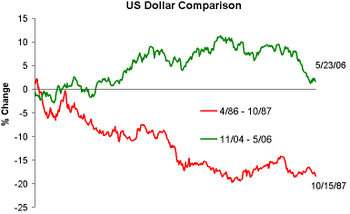 In comparison, the dollar index fell 45% from mid-1985 to the 1987 stock crash... Bond yields are rising, too, but the increase in yields was more severe in 1987.From the beginning of the year through Oct. 19, 1987, just before the crash, the 10-year note's yield rose from 7.23% to 10.15%. Since July 1, 2005, the 10-year yield has risen from 4.06% to 5.05%." 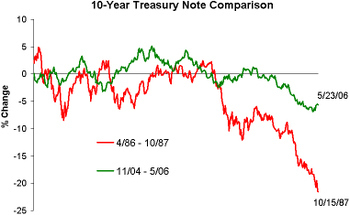 To add to Gaffen's point, we created charts comparing the changes in the 10-Year Treasury Note and the US Dollar in the year and a half leading up to the '87 crash and the prior year and a half. After the sharp selloff yesterday in US stocks, Japan actually rallied while most of Europe is currently trading down over 1.5%. 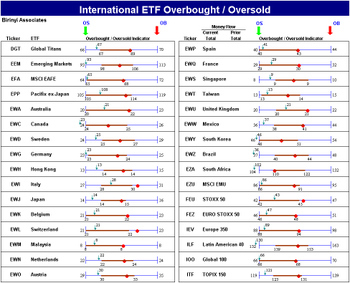 Below is our overbought/oversold screen of global ETFs. 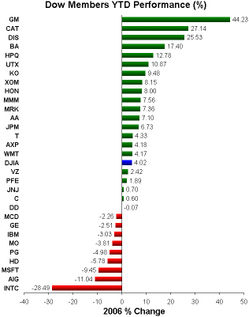 As you can see, most are oversold and none are overbought.